I couldn't decide on just one page, so I decided to do a double page. I wanted a happy and uplifting page, and I have used my Haute Mess Acrylic Paints to achieve this. Lots of layers to build up to this. 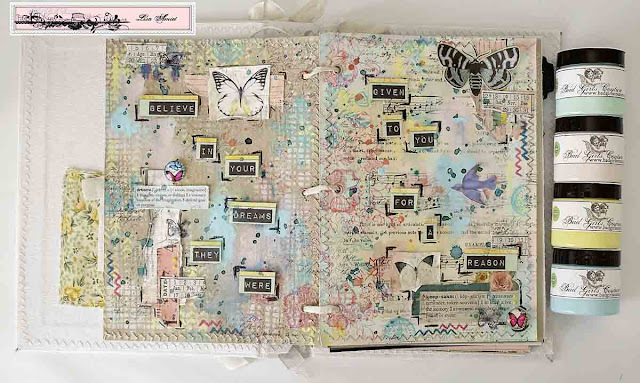 I love this Art Journal, the pages take anything that I throw at them. Beautiful stitching and excellent canvas quality. I have also used the Clear Gesso & Glass Bead Gel Mediums. I have a process VIDEO that you can watch HERE. I also do a flip through of my journal before I start. I hope you enjoy it, thanks for stopping by! 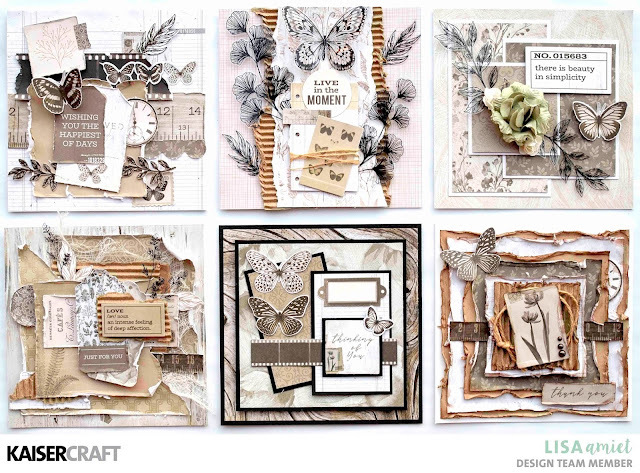 I'm here today to share some cards that I have created using this month's Whisper Collection from Kaisercraft. This is what I have created, a set of 6 cards. Lots and lots of layers and distressing in this one :) I love the natural feel to this collection, it's gorgeous. You can find the full instructions for this card HERE. I have kept it simple in keeping with the sentiment. I have added in some white card stock to help define the different patterned papers in the paper pad. I have also used some of the acetate Flora & Fauna, that I have fussy cut out. I have again gone for a similar design but with black cardstock. I think it really helps highlight the papers. I have used a mix of collections to create this, some Hazy Days, and some Air Mail. You can find the full list of products used below. Some Garden Party Word Stickers, and some Writer's Block too! I have used a flair from Um Wow Studio, that is from the Dreamscapes collection. Some Northern Lights Word Stickers. I loved this colour scheme and the natural frosty feel to the moodboard. I have added some corrugated cardboard for extra texture. I'm quite happy with how it turned out. Hello! I'm back again today to share another creation with you. 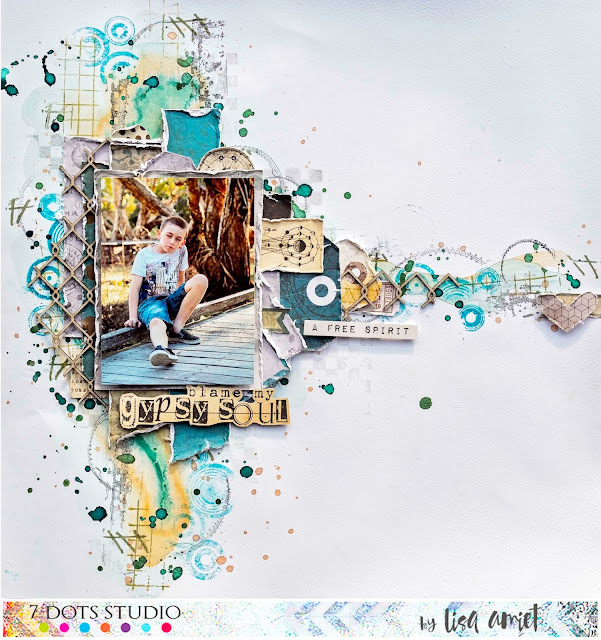 I have done a bit of a mixed media background for this layout, using a mix of colours, and different stamps. You can watch the video for this layout by clicking on the picture below. I have used the gorgeous Fortune Teller collection, with a little bit of Dreamscapes mixed in. I am in love with this teal colour! And I love all the gypsy elements to it. I have built up my layers of papers and I have added some 2Crafty Chipboard fencing for texture. I have used lots of the tags and die cut elements. I think my son really does have an old soul gypsy in him somewhere, as he is always wanting to wander and explore new things and places. I love this about him. Always ready for adventure. 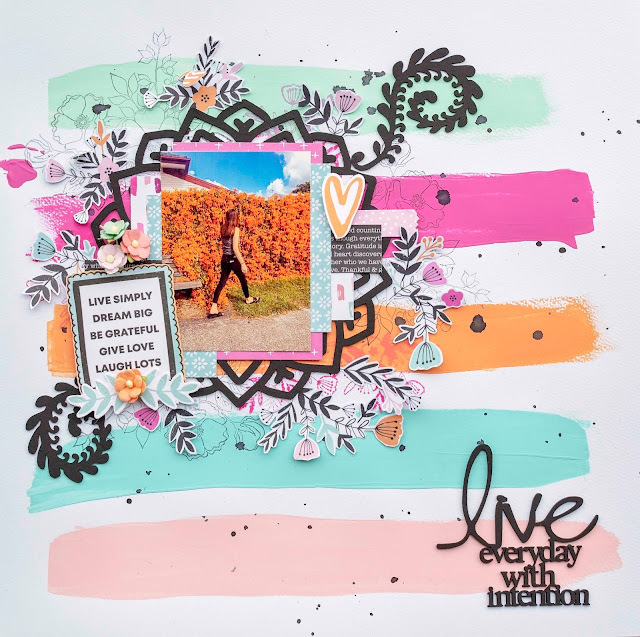 'Live every day with Intention"
I have a layout of my daughter in front of this gorgeous orange trumpet vine. Every year there are lines of people waiting to take their photo in front of the flowers. The owner has done a wonderful job with this one. It's been there for a long time. For this layout I have started with a few swipes of my amazing Haute Mess paints. I have added some stamping around where I want the Mandala to sit. I have then used the gorgeous '6" Mandala No 1" as a frame for my photo stack. I have finished it with black gesso, giving it a great matte finish. I have then used a couple of the foliage swirls from 'Foliage Set 4', that I have again finished with black gesso. I love how the black pops against the colours! I have used the 'Blessed' collection from Kaisercraft. I hope you all had a wonderful holiday season. 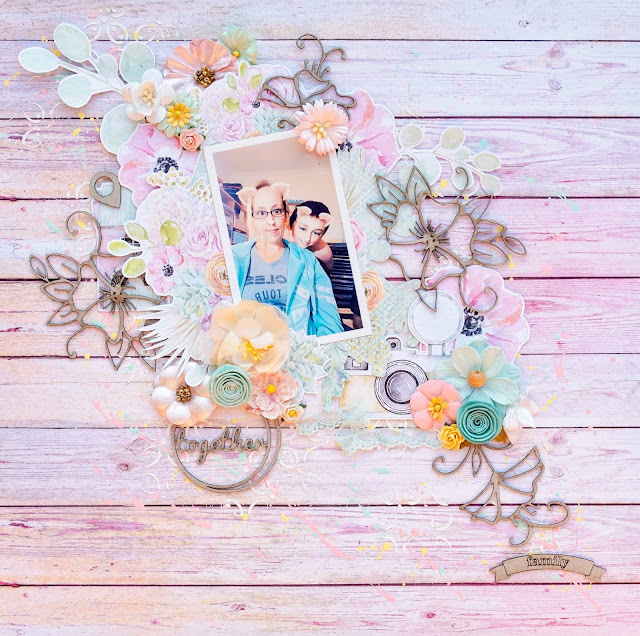 For this layout I have decided to leave my chipboard raw, I love how it looks with all the lovely pastel colours, from the Lovely Day Collection from Mintay Papers. I have used some of the '11" Fine Floral Frame Set', among my layers. More of the fine florals mixed in with the fussy cut flowers from the collection and some gorgeous Prima & Lil Birdie flowers. I hope you like what I have created, I will be back later in the month to share some more 2Crafty goodness with you.